Give gifts with a personal touch with ideas from this FREE e-book! Wake up to the aroma of your French Roast Christmas Tree, coffee bean ornament or three bean sphere. If you're not a morning person this may be the way to get you out of bed. Not only do they smell great but they make a decoration as well. 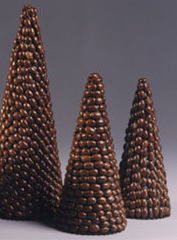 Cones: 6" x 3"; 8" x 3"; 12" x 4"
Whole roasted coffee beans, 1/2 lb. Paint foam cones brown and let dry. Rub glue along bottom edge of cone and then press a row of coffee beans side by side into glue. Position beans horizontally, vertically, or at an angle, keeping the direction uniform (see photo). Continue adding rows of coffee beans until foam is covered, working small sections at a time. Let dry completely. Spray coffee beans with sealer; let dry. Using pinking shears, cut a circle of brown felt to match bottom of each cone. Glue felt to bottom of trees. Whole roasted coffee beans, 3/4 C.
1-1/2" gold sheer ribbon, 1/2 yd. Paint foam ball dark brown and let dry. Glue and insert metal ornament cap in foam ball. Starting at top, glue coffee beans on end to ball around metal cap. Continue to glue coffee beans in circular rows around ball until covered. Let dry completely. Spray coffee beans with sealer and allow to dry. Hot glue tassel to center bottom of ornament. Tie ribbon in a small bow and cut Vs in ribbon ends. Hot glue bow to top of ornament. Thread cord through metal cap's wire hanger and knot ends to form loop. 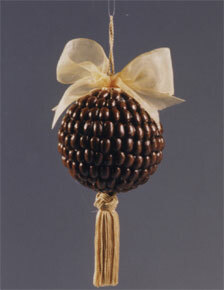 Glue knot to ornament. 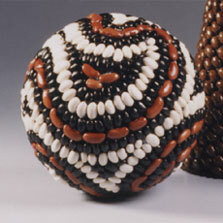 Working on a small section at a time, cover portion of ball with glue and adhere dried beans close together. Using photo as a guide, glue small areas of kidney beans outlined by black beans and then navy beans. Continue until entire ball is covered. Spray beans with sealer and allow to dry. ®™ Trademark of The Dow Chemical Company ("Dow") or an affiliated company of Dow. For more project ideas, please see styrofoamstyle.com.